An article I wrote for Our Sunday Visitor Newsweekly is online now and in print next week. It focuses on statistical projections of Church life 25 years into the future in 2035. One of the themes is how we will likely need to deal with parish and sacramental life that includes many fewer priests (i.e., if current trends continue). One of the surprises of the research is that few Catholics say they have been personally affected by a shortage of priests yet in CARA Catholic Polls (CCP). Perhaps it’s all an issue of localized change? You may hear about one or more parishes closing in your diocese but these changes rarely get “aggregated” in a national perspective (... from 2000 to 2009, the number of parishes in the United States declined by 6.2 percent or -1,278 parishes). Taking its toll: "The Diocese of San Bernardino is closing a 50-year-old parish in the desert community of Joshua Tree, citing “the ongoing priest shortage” as the reason." Flowood priest growing leaders, fostering creativity: "With a priest shortage worldwide, more emphasis will be placed on church members running the day-to-day operations." Fall River Diocese pulling chaplains from area high schools: "The Diocese of Fall River is removing all full-time chaplains from its high schools in the midst of a priest shortage." Parishioners celebrate last Mass at Nicoma Park church: "The Archdiocese of Oklahoma City is closing the church because of a shortage of priests. The church was formed in 1949." Monsignor retires from St. Joseph Church: "He's pastor to more than 2000 families at St. Joseph and he has no assistant because of the priest shortage." Notice the trend in just this small set of recent news results where parishes are being closed and ministries altered not because there are too few Catholics but because of too few priests. Also note that these stories really are scattered all across the country from California to Oklahoma to Massachusetts. In the OSV piece I note that we are all likely in for “steady change” and that parish and sacramental life will be significantly altered for practicing Catholics in the years to come. CARA is currently conducting research for the Emerging Models of Pastoral Leadership project to identify and understand emerging pastoral leadership models that can sustain vibrant Catholic parish life in the United States in this changing environment. This collaboration of the National Association of Lay Ministry (NALM) with four other national ministerial organizations—the Conference of Pastoral Planning and Council Development (CPPCD), the National Association of Church Personnel Administrators (NACPA), the National Catholic Young Adult Ministry Association (NCYAMA), and the National Federation of Priests’ Councils (NFPC)—is funded by The Lilly Endowment. It began in 2003 and is scheduled to conclude in 2012. Research has and will continue to focus on many parish life issues including multiple parish ministry and parish clustering, recruiting and training the next generation of pastoral leaders, the role of finance and pastoral councils, and Canon 517.2 parishes where pastoral care has been entrusted to deacons or lay persons. The research has already or will eventually include surveys of pastors and those entrusted with the care of a Canon 517.2 parish, parish staff persons and volunteers, other parish leaders, as well as parishioners (in-pew). Bishops have been interviewed as part of the project and statistical trends have been and continue to be scrutinized. Much of this research is available on the Emerging Models website (linked above) now or will be available in the future once all projects are completed. As I note in the OSV piece, unforeseen changes are always likely and let us hope and pray that the projections are off the mark and that the future only holds good news for the Church. I would not mind being wrong on this one. The Catholic University of America (CUA) in Washington, DC has announced the appointment of John H. Garvey as the third lay president in the university’s 120 year history. Using the database of members of the Association of Catholic Colleges and Universities (ACCU), the largest member-based association of Catholic higher education institutions in the United States, approximately 55% of presidents at member Catholic colleges and universities are lay men and women. The largest proportion of presidents at member Catholic institutions is lay men (40%), followed by priests and religious brothers (27%). Lay women are president at 15% of institutions, while religious sisters are president at almost one in five institutions (18%). A similar distribution is evident among principals of Catholic high schools in the United States. Recent CARA surveys of these school principals for the National Catholic Education Association’s (NCEA) indicate 62% of principals of these secondary schools are lay men and women. The largest proportion of principals is lay men (41%), followed by lay women (21%). Priests and religious brothers are principals at 19% of Catholic high schools. Religious sisters also make up 19% of principals at these institutions. 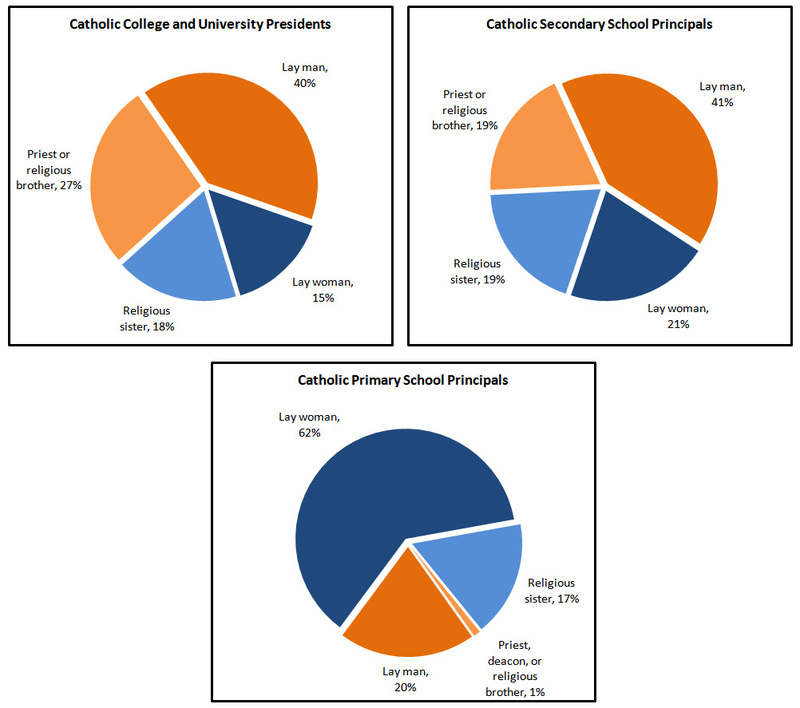 Catholic primary schools exhibit a very different pattern of leadership by ecclesial status according to recent CARA surveys of these school principals for NCEA. More than six in ten Catholic elementary schools has a lay female principal (62%). Lay men represent 20% of principals at these institutions. Only 1% of Catholic elementary school principals are clergy or religious brothers. Seventeen percent of Catholic primary school principals are religious sisters. Special thanks to the staff at ACCU. Note: Although religious sisters and religious brothers are canonically also lay persons the figures above distinguish between those who are religious sisters or religious brothers and other lay persons to describe ecclesial status. Surveys don’t often allow for one to say much about Americans who self-identify their race as Black, African American, Afro-Caribbean, or African and who also self-identify their religion as Catholic. It is all a problem of numbers and random selection. In a typical survey of the U.S. adult population only 1,000 people are randomly selected and interviewed. Of these, fewer than 10 respondents would be expected to self identify as a Black Catholic—far too few to make any inferences whatsoever. Even in a typical CARA Catholic Poll (CCP), in which the sample typically includes at least 1,000 randomly selected adult Catholics, fewer than 50 of the respondents would be expected to self-identify as Black or African American—still too few for an acceptable level of sampling error for this sub-group. To obtain even a somewhat reliable portrait of the Black Catholic population in one survey requires a specially designed over-sample of this group or a very, very large survey (which is often financially prohibitive). Two of the latter have been done in recent years—The Religious Landscape Survey by Pew Forum on Religion & Public Life in 2007 and the American Religious Identification Survey (ARIS) in 2008. The results presented in this post are generated from the Pew survey data (in this survey an unweighted total of 35,957 adults were interviewed of which 252 self-identified as Black and Catholic; resulting in a margin of sampling error for this sub-group of ±6.2 percentage points). Of all adults in the Pew survey who self-identified their race as Black in the United States, 8.2% also self-identified their religion as Catholic (representing 4% of all adult Catholics in the U.S.). Extrapolating the results to the total population in 2010, it can be estimated that about 3.5 million U.S. residents self-identify as Black and Catholic (this estimate includes adults and children). So who are the adult Black Catholics in the United States today? A significant number of African Americans were raised Catholic and have subsequently left the faith. The “retention rate” for Black Catholics is lower than for Catholics overall. This rate is the percentage of those raised in the faith who are affiliated with that faith as an adult. Overall, for Catholics in the U.S the retention rate is 68%. However, among African Americans who are raised Catholic, only 57% remain Catholic as adults. Thus, 43% African Americans raised Catholic are estimated to have changed faiths at some point. Where do these former Catholics go? Nearly two-thirds (64%) affiliate with another Christian faith. Three in ten (30%) either identify with “nothing in particular” (28%) or say they are agnostic (1%) or atheists (1%). This result is also different from the overall pattern among adult Catholics in the United States who are less likely to adopt another Christian faith if they leave Catholicism and instead are slightly more likely to identify with “nothing in particular.” Thus, African Americans who have left the Catholic faith are more likely than all former Catholics in general to choose another Christian faith. It is important to note that these results are only based on 252 randomly selected individuals (N=851 when using the Pew weights). There is a need for a sampling design that increases the number of interviews in future studies for this sub-group of the Catholic population to ensure a more reliable portrait is available. Also, both the Pew and ARIS studies are based on questionnaires intended to be used by people of all faiths. Thus, there is limited content that can speak to issues that are specific to Catholicism. At the same time, these sources represent the best available data to study this sub-group of Catholics. For those interested in more information, the United States Conference of Catholic Bishops (USCCB), the Subcommittee on African American Affairs (SCAAA), the National Black Catholic Congress (NBCC), and Xavier University's Institute for Black Catholic Studies (IBCS) have additional information and resources regarding Black Catholics in the United States.